‘I am very passionate about opening up conversations with children about important topics at a young age, particularly around situations that don’t make us feel good on the inside,’ the Youth Focus Joondalup counsellor said. 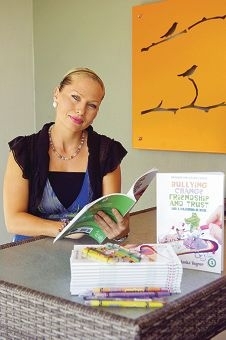 Bullying, Change, Friendship and Trust, which doubles as a colouring book, encourages children to answer questions about thoughts and feelings and decision making. Vagner, who works to prevent youth depression and suicide, said she aimed to help parents have deep and meaningful relationships with their children and teach them in a fun and creative way about feelings, values and overcoming difficulties. Conversation topics include bullying, friendship, trust, change, conflict with friends, grief and loss. Parents can follow Vagner’s weekly posts on her Facebook page Bobo on the Gogo. Vagner will be selling the book at the Whitford Junior Football Club registration day from 8am to 1pm this Sunday to raise money for the club.